The Synod Preparatory Commission selected, ‘People of God responding to Christ’s call’ for the theme of the Second Diocese of Juneau Synod. As we conclude the Year of Faith, we will gather to respond to the call of Jesus, ‘To put out into the deep for a catch’—Duc in Altum. We will gather as a diocese to plan for the future of our Church in Southeast Alaska. As we go into the 11th week before the Second Diocesan Synod we have posted a list of the Synod members who have responded ‘yes’ to their selection as voting members of the Synod. 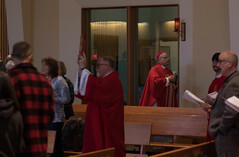 The Synod Preparatory Commission has Resolution Guidelines that are now posted on the website as well and we have reviewed our first resolution dealing with the administration manual for the Diocese. • Caring for the Church and each other. For the most current information, check out the Synod website: http://www.evangelizeseak.com. This website is updated every Monday as well as for other important changes and announcements. Volunteers will be needed for Synod Committees for Hospitality, Transportation, Communications, Liturgy, and Set-up. If you can donate Alaska Airline miles and companion fare tickets to bring delegates from across the Diocese to Juneau please call Peggy Mattson @ 586-2227 ex 31 or email dioceseofjuneau@gci.net. If you can provide housing for delegates in Juneau please email your contact information and details for room(s) and number of beds or number of Synod members you are willing to have stay with you. There will be tables for Diocese and parish ministries information, such as Catholic Relief Services, set up in the Narthex at St. Paul’s during the Synod weekend. Please contact Peggy at the above email or phone listing if your ministry would like to be included so we know how many tables to set up. Please continue to pray for the success of our Diocesan Synod and for the furthering of the Church’s mission in Southeast Alaska. Bishop Burns desired to have 1-3 representatives from each parish/mission (depending on parish size) to act as Synod Members. This limits the number of Synod Members to a reasonable and manageable number. There are many qualified lay faithful who could act as Synod Members. The most basic qualification is that a person is a practicing Catholic in good standing with the Church and is willing to make a Profession of Faith. Another aspect of selection was the desire for a representative sampling from among ethnic and social-cultural minorities, and other groups who are important to the Church and whose faithful voices provide important insight and perspective into the needs of the pastoral ministry of the Church. Clergy are automatically Synod members as well as all active Deacons. 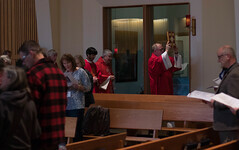 Further, Religious who have ministry appointments in the Diocese are also included in the selection. The intention is that the various demographics of the Church are duly represented and contribute to their consultative role to the Bishop as Synod Members.